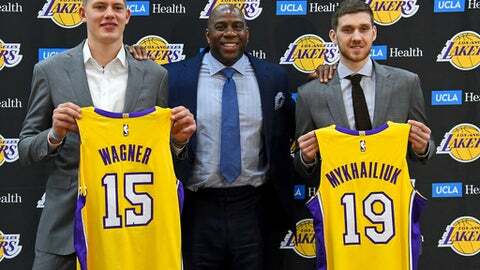 EL SEGUNDO, Calif. (AP) Magic Johnson is betting his job on his free-agent recruiting skills for the Los Angeles Lakers. Johnson declared Monday that he will step down as the Lakers’ president of basketball operations if he can’t persuade an elite free agent to sign with the 16-time NBA champions within the next two summers. ”Next summer, if nobody comes and I’m still sitting here like this, then it’s a failure,” Johnson said after a news conference to introduce draft picks Moe Wagner and Svi Mykhailiuk. Johnson was put in charge of the Lakers’ front office by owner Jeanie Buss in February 2017, and the former superstar point guard immediately announced his plans to revive the struggling franchise by enticing the game’s best players to join as free agents. With Paul George and potentially LeBron James headlining the market this summer, Johnson is leading the Lakers’ efforts to land both players this weekend. If they sign elsewhere, Johnson and the Lakers will pursue the large crop of 2019 free agents. And if he strikes out with every big name, Johnson said he will quit. Although the Lakers are mired in the worst five-year stretch in franchise history and haven’t made the playoffs since 2013, Johnson and general manager Rob Pelinka have been successful in achieving their initial goals since they took over 16 months ago. They have solidified a decent core of talented young players – Brandon Ingram, Lonzo Ball, Kyle Kuzma and Josh Hart – to provide their potential free-agent signees with support. They have made several slick trades and personnel moves to clear enough salary cap room to offer two mammoth free-agent contracts this summer. Now comes the tough part: Persuading George or James or other big names to move to Hollywood. Johnson said he has no idea whether the Lakers’ pitch will be well-received, but he also feels confident in his task. Johnson is the second straight basketball decision-maker for the Lakers to create a self-imposed deadline for success. The Lakers badly missed that deadline, and Buss’ sister fired him and general manager Mitch Kupchak in February 2017. Johnson and Pelinka are spending this week honing and fine-tuning their free-agent pitches. They’ll show their plans to Jeanie Buss later in the week, along with numerous contingency plans for the short-term and long-term future.